In Pasadena, California, we stopped at Congregation Ale House on a recommendation by the Drunken Tomato. There are three locations around Los Angeles for this church-themed restaurant and with all of their beers on tap, I can see why it’s so successful. However, we weren’t here for the beer, we wer here for the bloody mary. This mix was by far the best we tasted in Los Angeles. Very fresh, with the right amount of spice and a pleasant consistency. And at $6, you just can’t beat the price in LA! 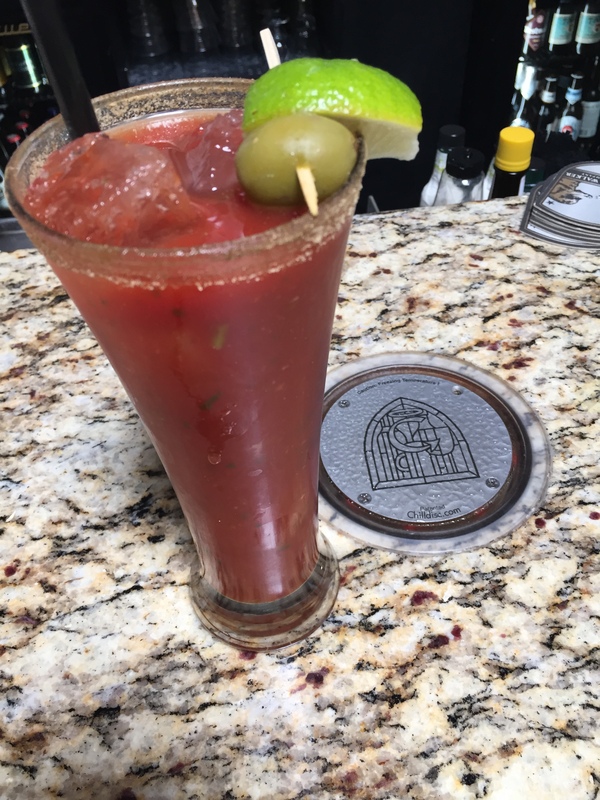 Their chalkboard touted a “Bloody Mary for 2” for just $10 on Sundays, which is also a great deal. We also dined here on this occasion. There is no table service. You have to order at the counter. They have a limited menu of burgers/sandwiches and a wide array of dipping sauces to accompany their fries, wings, etc. In addition to loving our bloody mary, we also enjoyed our Grilled RibEye Burger with fries (and curry ketchup!) very much. If you’re in the LA area, check out the “chapter” near you!